Have you come across the new SRM Stickers yet? Well, they are sponsoring the new challenge over at Caardvarks and BOY their products are gorgeous. 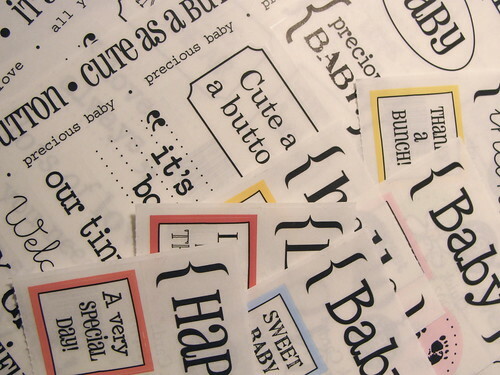 They've just started this new line of card sentiment stickers, and they are so easy to use. With this card, I used a sticker from the 'Thinking of You' set, and combined it with THIS gorgeous new digital paper from Jen Martakis - just my kind of digikit. Supplies: Sticker - SRM Stickers; PP - Jen Martakis, Bo Bunny; Stamp - Pink Petticoat; Notecard and gems - Hero Arts; Ribbon - Creative Impressions. Check out SRM's new blog for loads more gorgeous ideas. 2 6x9" sets (Baby and Love) and 6 Quick Cards sets. And you never know what else may slip into the package. You have until Monday 22nd to enter. And click HERE to check out the Caardvarks challenge. First...I'm the first to comment and the first NEVER wins!! he he but yes I'm loving SRM stickers!!! And every time you post a new digikit I end up buying it!!!! LOVE LOVE your trees!!! makes me long for srping! Love the tree card. Always love visiting you Lucy! Those trees are wonderful Lucy! I am loving the new colors of distress inks- especially wild honey. omigosh, lucy, i LOVE this card!! the details are amazing ~ your stitching, the dimension, how everything just floats off the page, that yummy polka-dot paper, the woodgrain on the tree trunks, and of course the tiny touches of pale pink. oh, and the stickers!! YES!! I am in love with the way the SRM stickers just melt into the paper. You can't even see the edges, it's fantastic! I hope I win so that I get a chance to try them out! My new favorite thing has got to be Skipping Stones stamps. Who wouldn't love a bra stamp set anyway?! lucy this is a striking card, love the colours, the trees look amazing. My new favourite thing has got to be digital images. Its taken a while but now I am addicted!! right now i'm loving anything PTI! Lovin' the greens here - spring must be on its way! I'm not much up on "new", but I'm loving the newest flower woodblocks coming out by Hero Arts. Thanks, Lucy, for the chance to try these....haven't used stickers for a very long time. I'm loving my new Brasil set of brads... Simple and with brilliant colors. They're from Artemio (www.artemio.be). I'm dying for those stickers! The stickers are fantastic! Right now my new favorite stamp is CTMH A Tweet - the bird is so cute with the branch! Thanks for a chance to win! Lucy, Love your card - FAB stickers. Thanks so much for the chance to win. Am loving digi images from Heather Ellis at the moment. Is this some stamp you have use to tree..
Oh I love these stickers, they look so good on your card. I'm loving digital kits especially the one by Shirley Castillo, Kitty Kat Kits - so cute! My favorite new product is the Martha Stewart scoring board. You should definitely try it. I'm so far behind in what is NEW that I can't even recommend anything- so sorry! I do love everything you post and would love to try these stickers--I want to be with the "IN"!! Love love love your blog:) TFS! This card is simply like a piece of art...perfect in all the details and composition. I'm falling in love with these SRM stickers and digit kits!! Very cute card. Love those trees. I have been stamping for 18 years, so there isn't much that impresses me anymore. I do have to say I love the new Cosmo Cricket buttons and papers. Hope you are enjoying your weekend. I am loving trees these days too! I guess we are all longing for spring. I wouldn't say that it is new, but i am loving MS flocking powder. It comes in soooo many fun colors! have a particular style, very stylish! these stickers I've never tried them, I would try it! Lucy your card is amazing. Love all the details, colors and dimension! I love the new flower wood stamps and silhouettes - the shadow inks are great too! Thanks for the chance to win :) Never used the stickers before but they look great! Jenny F.
I can see using those stickers all the time! It would be impossible for me to pick a favorite as it totally depends on the project! Hi Lucy! What a stunning card today! Gorgeous! My favorite new product is something that I finally got this week and it's awaiting my use, the Blooming buttons Set by PTI! I also got some chocolate buttons too, I know you love buttons and the PTI ones rock! And the stamps from My Cute Stamps. LVOE the baby stuff. I am working on a baby shower this weekend.....would be so perfect! Love visiting your blog Lucy! I love the new Distress Inks by Tim Holtz - the colours are so beautiful and modern. Thanks for the chance to win some new toys! I love being enabled. Trees, trees, trees.. Love them cause they always look perfect even if there are no leaves. Firstly, I love all your creations, so keep up the inspiration as I visit your blog daily. Secondly, beautiful card as usual, love the green. This whole "sticker" thing is new to me but sounds like fun, especially for a quick and easy variety of sentiments that one is always looking for. And thirdly, boy, what recommendation could I make that you don't already have, but cuttlebug embossing folders are my craze at the moment, I want ALL of them!!! Yep, greedy hey. Thanks for the opportunity to win something. Hello Lucy! Love the new "Express Yourself" Stickers and the card is beautiful - love the colors and all of the embellishments. Thanks for thr opportunity to win! FLOWER MEDLEY! Can't wait to compare the look of rub-ons to stickers. Love your card today! How cute! I have to say my new fave product is the asian folders by cuttlebug that they released at CHA... waiting to get my hands on them! All the new PTI products that were just released...the new die cuts, stamp sets, the wool felt and so much more are my newest favorite products. Hi Lucy. Another great card. I love that you post every day - always something to check out. My favourite new product would be the big scallop nestabilities. Love those. WOw love love love this group! Just love your trees! Really like how you've added the notepaper behind them, neat idea. The stickers look cool and meld with the paper so well they don't look stickish. would love to try the new stickers- i haven't seen them here yet. I wish I had a new product to introduce you to but truthfully, I look to YOU for new product ideas to try! How fun is this?! What an adorable row of trees and love the dimension you've given them! Marhtar Stewart glitter. It not new to alot of you guys but its new to me! very cool! I love your color combo - so bright and springy. I also love how you added the little pink hearts in there. My favorite new product is probably Copic markers -- I know they are not really new...but they are new to me!!! From one Lucy to another, thanks for the opportunity to win. My favorite new product is my Martha Stewart scoring pad. I had a scorepal, but often had problems because there wasn't a scoreline where I needed it. I don't use her scoring tool-I prefer an embossing stylus. I've had the chance to play with a few SRM stickers before and they are awesome! I am lusting after the new MS border punches and anything JB Soup. What a lovely card! Those stickers look like must-haves :)) I liked the Dear Lizzy line that was released at CHA - such fun stuff! Thanks for the chance Lucy! I know I'm a little slow but my new favorite product is Basic Grey paper pads! They're awesome for cards! I think my favourite new product has to be the new Cosmo Cricket mini decks. They are super cute! Great card. I've never had good luck with stickers on my cards, so I'd love to win these and give them a try, since you say they are great. I love the cuttlebug embossing folders - The cards I have seen embossed with these are great. Unfortunately I have a Sizzix sidekick - too narrow to use the Cuttlebug embossing folders with, but I hope to buy a set of border embossing folders one day which I think will fit. The SRM stickers look great. Thanks for a chance to win. I'd never heard of SRM stickers before, but they look great. The new things I've just gotten that I can't wait to use: a Martha Stewart "deep edger" punch (I don't have any kind of die cutting machine, so love my punches) and some gorgeous small roses by Prima in pink, turquoise, and cream. Love your card, Lucy! Stickers have come such a long way, haven't they? Amazing clarity! Although I didn't get them yet, I just KNOW I'm going to love the new Distress inks! Can't wait for mine to arrive! I am loving my new Scor-Pal! Thanks for making us aware of this new product! My new fave is a paper/embellishment line from Bo Bunny--Mamarazzi (not to be confused with Paparazzi:))...so original and different! My new favorite product would have to be the Hambly transparencies. I haven't seen them in my remote part of the area yet but I've ventured to find them online and are amazed what people can do with them. Looking forward to shopping in the big city so that I can find some of my own. I haven't seen those stickers before, but they look pretty cool. Favorite new products are anything from Papertrey Ink....and the Birds on a Wire border punch from MStewart. Love all the dimension on your tree card! I love the 3D effect on your card, makes you just want to reach out and touch. New product - Elmer's Adhesive Dot Stamper. Intriguing idea, but there is a learning process for me, as to where exactly that little dot gets places. that was some mission you sent us on... but finally I think I have an answer: the Quick Cards - Happy is my new favorite. But I'm sure you'd make miracles with any of them! Thanks for the chance to win this candy! Wow, great card, love how you crumpled the tree tops!!! I'd say anything form PTI or Ippity by Unity. 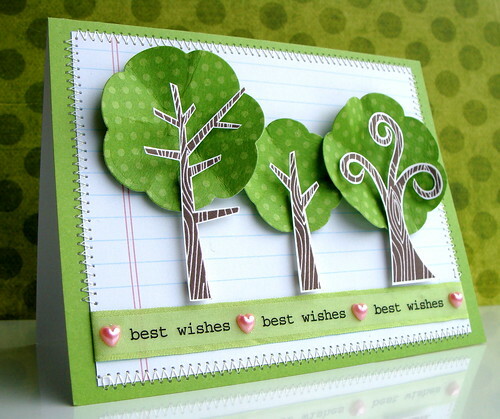 Your cards are so sweet...love the trees and the sentiments are also so sweet! I haven't gotten any new products lately but my favorite old product is Liquid Applique for making frosting on cupcakes. Love how you did those trees! SO much great dimension. My new favorite product...anything from the Hero Arts 2010 catalog and I'm just barely starting to collect a few Copics... :) Thanks for the chance to win!! Awesome cards you made with the SRM sticker!!! My favorite are the Quick Card stickers!! I love all the digikits you have used for your card (especially the cats). The nice thing about digi is that I can buy it from all over the world without the shipping costs which is nice because Belgium does not have many nice craft-shops and i often have to buy nice things from other countries. That is SUCH a cute card! Thanks for the giveaway! Your cards alays so inspiring! Right now, I am loving PaperTrey Ink new stamps. Just ordered those and impatiently waiting for them to arrive. 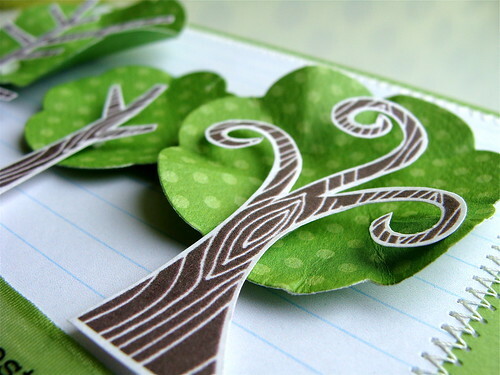 I Love this card soo much...It's totally Tree-iffic!! he he. Thankyou for the opportunity to win those gorgeous products. My favourite NEW product is my Stamp-a-ma-jig from Stampin' Up. I can now line up my wooden stamps perfectly where I want them, so all my old stamps that I had forgotten about have been given a new lease of life! !